SO, THE BEEF WAS IN THE WALK IN FRIDGE FOR 22 DAYS. 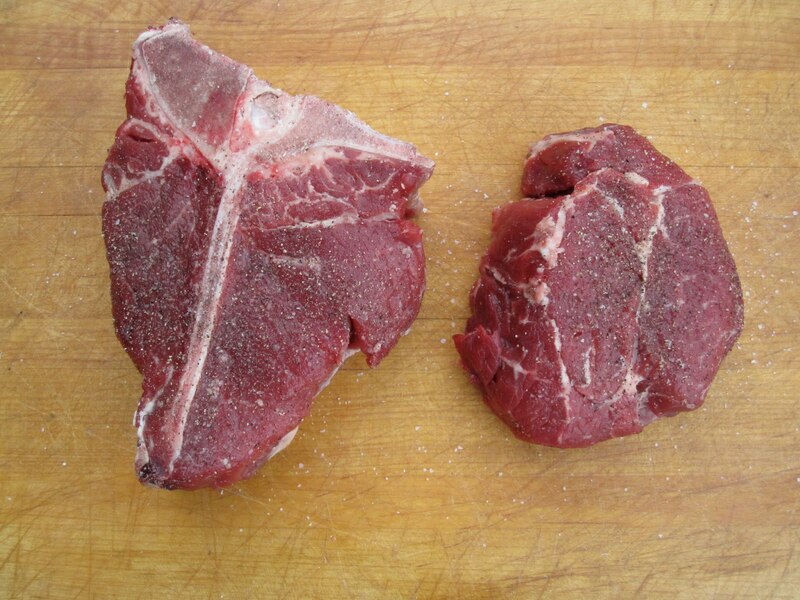 (I CUT THE 28 DAYS SHORT AS THE MEAT WAS PRETTY LEAN AND DRYING OUT FAST) THEY WERE BROUGHT OVER TO THE BAND SAW AND I CUT AND TRIMMED OUT SOME PRETTY BEAUTIFUL PORTERHOUSE AND RIBEYE STEAKS, ABOUT 2-3 INCHES THICK. THEY WERE GRILLED AND CRITIQUED. THOUGH THERE WAS NOT TONS OF FATTY MARBLING, THE MEAT WAS NUTTY AND BEEFY IN FLAVOR. TENDER AND SWEET. THE RIBEYE WAS MY FAVORITE AS IT CONTAINED THE MOST MARBLING. I HAVE BEEN EATING THE RESULTS FOR THE LAST 3 DAYS. A GREAT SUCCESS.